As night falls, families begin to arrive with their children, carrying bundles laden with provisions and blankets. We don’t know if all of the children of the surrounding farms are accounted for; there’s no way to accomplish that, given our means, but we’re confident that most of the families have answered our call. Drachus and Aibreann approach, and it sends Selben into a panic. The young man’s eyes roll back into his head, and he falls to the ground, pounding it in a fury, seemingly overcome—physically, mentally, or magically, we cannot determine—and immediately we disarm him of the knife he used earlier to save Erathmar. Unsure how to proceed, I grab the bucket of water we used to soak the leather straps, and I douse him with it. Fortunately, he becomes more lucid. Unfortunately, Selben is still panicked and attempts to escape. Drachus and Aibreann disappear into the town, and with Audric’s help, we tackle and subdue the young man. After several minutes of pinning him, preventing Selben’s escape, and after more than a few threats to bind him, it seems like Selben regains awareness. He admits to not remembering the events of the past few minutes…as if he blacked out again immediately upon seeing Aibreann. Unwilling to allow another encounter like that to occur, we take Selben back to Erathmar’s camp, where we intend to spend the night. Selben falls asleep nearly immediately, seemingly exhausted, and I find a quick few hours of rest before I’m awakened for my watch. During my watch, Selben starts tossing and turning in his sleep. He starts to visibly sweat and utters a few words. “I saw her. I see her.” The fear that Selben may be under some kind of magical influence has been constantly on my mind, and for the first time in over a year, I whisper a prayer to Malar, calling upon my faith to sever any potential connection or possession. Malar answers, but for better or for worse, it does not seem as if there was any compulsion, or at least, Malar’s blessing had no effect. 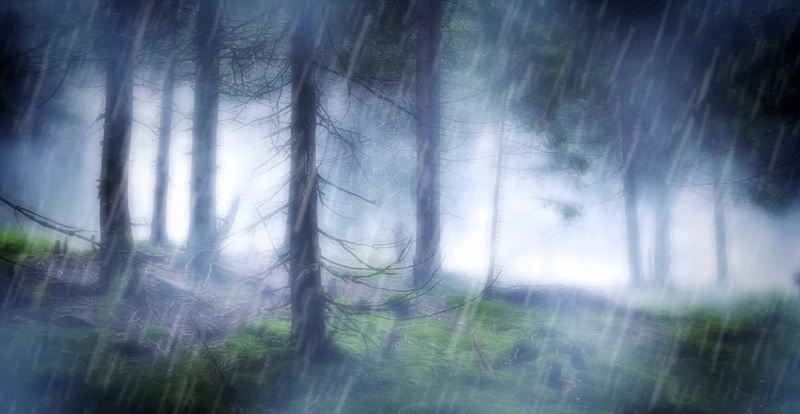 We are awakened by rain, but other than that ill herald, we are not troubled by anything else, and find that nothing ill befell those of Carrock while we slept. The next morning, Audric and I have a lengthy conversation regarding his current mental state after the encounter in the woods, his thoughts on the pending threats to Carrock, and plans for the short term. It is decided, should the situation in Carrock remain unchanged for two more days, that we will make ready and depart towards Mirabar, where Audric may find a temple to Mystra. We head into the village to find Drachus. Immediately upon making that decision, however, we hear the cries of a woman in the southern part of the village. As we circle down towards the calls, we see that there’s someone coming from the road to the west. The rain is heavy, but her calls pierce the veil. The woman, limping, leads a pony which looks as if it has something—a body?—slumped over the saddle. She is short, lithe—almost childlike—perhaps the same age as Aibreann. Her hair is long, blonde, and tied into a tail. She wears traveling leathers, a bow slung over her shoulder and a sword at her hip. We are able to see that her cargo is indeed a body. Audric and I approach, answering her call. She says that the village was attacked and razed nearly two weeks ago, a tale that reeks of what befell Shadfeld. Westtower was better prepared for such an attack, having a small garrison of soldiers, but many of its soldiers were killed and the town half-destroyed. Carcerus was among the attackers, bearing a wicked hook-bladed axe, and Bonie reveals that the guards that confronted him could do nothing to injure the beast, as if their weapons were useless. Bonie and her friend were passing the trade season at Westtower, and in the aftermath of the attack, they volunteered to serve as envoy to Shadfeld. They found Shadfeld in ruins and decided to continue on to Carrock…whereupon they were attacked by wolves in the night. The gnome—Larimo—bought her the time to fend off the beasts, but only at the cost of being severely wounded himself. We take the pair to Erathmar’s camp and send for Drachus and Tussugar. I recruit Selben to help care for Larimo’s wounds, and after sharing her tale again, we realize that the attack was just a few miles outside of Carrock—close enough for us to scout. Drachus offers us horses from the village, and together with Rould we depart to investigate. We find the site of the battle—they had camped south of the road, and the wolves attacked from somewhere to the north. Audric questions her, discovering that they built a fire—and we all find it odd that wolves attacked in the night despite the presence of their fire. Larimo is not a warrior, but Bonie reveals that he has “the favor of one of the gods of his race.” A priest, perhaps? She seems skilled in both bow and sword and tells us she was employed previously as a guard in Westtower. She says that she killed most of the pack that attacked them, perhaps four in total. Because of the rain, our hopes of learning anything else here is slim, so we return to Carrock. Night approaches once again, so we carry out preparation to protect the children. We show Bonie around town, explain the defenses, as well as the potential threat of attack in Carrock, whether from Carcerus, wolves, or this “Goddess of the Hunt.” Bonie seems unimpressed by our lack of a plan, but we counter her argument, explaining that we’ve considered various options, but most of them involve leaving the village unprotected, which seems too risky—something she should hopefully understand, considering the proximity of the wolves that attacked her and Larimo.